Hope you had a great weekend! This weekend was my official birthday weekend (I know, I've dragged it out way too long) and what better way to knock two trends (mint and polka dots) with one stone than to wear them together as my birthday outfit! I've been lusting over pastels, mint in particular! 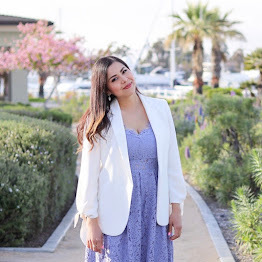 Pastels make me yearn for spring! For now, I darkened the outfit with this polka dot blazer. For my birthday I enjoyed an intimate dinner with my family at, where else? The Prado in Balboa Park. Have a great start to your week everyone! Espero que hayan tenido un gran fin de semana! Este fin de semana fue mi cumpleaños oficial (ya sé, lo he prolongado demasiado) y qué mejor manera de usar dos tendencias (el color menta y lunares) en un tiro juntos en mi cumpleaños! Me encantan los colores pasteles, la menta en particular! Estos colores me hacen querer que ya sea primavera! Agregué esta chaqueta de lunares para oscurecer el look. Para mi cumpleaños tuve una cena íntima con mi familia en, dónde mas? El Prado en Balboa Park. Que tengan un gran comienzo a su semana! polka dots with green can do no wrong! following your lovely blog now! Thank you Maiken, I had a great birthday! You look so cute! How funny is it that I literally just purchased those same pants and blazer from Forever 21 last week. I Like how you styled it! awesome! I love these two pieces they are so versatile! Feliz cumple tocaya querida!!! espero que hayas disfrutado muchisimo!!! me encnata el pantalon que llevas creo que el color es perfecto!! Aww, how cute..love the family pics and it's such a perfect outfit for your official bday dinner. Don't worry I celebrate my bday at least a week. lol. You look so classy & pretty and I really like the combo of the mint pastel pants and the polka dots with the necklace. I've been seeing polka dots everywhere and I'm loving the trend! I need to eat at Prado sometime, yum! Thanks Dale, you are always so sweet!! if you're ever in SD let me know, The Prado has a great happy hour! such an adorable look,very well executed! Ahh so cute, the mint colored pants are great! Hope you had an amazing birthday!! you look great- especially love the first shot! you look stunning!!! and your blog is amazing!!! !wonderful post!! me ha encantado el conjunto! pero los pantalones una preciosidad! te sientan de fabula!! great combination of latest trens! I absolutely love both, blazer and mint pants. Happy Birthday! Come to my blog again and enter my giveaway, I also have new outfit post! BAUTIFUL look! 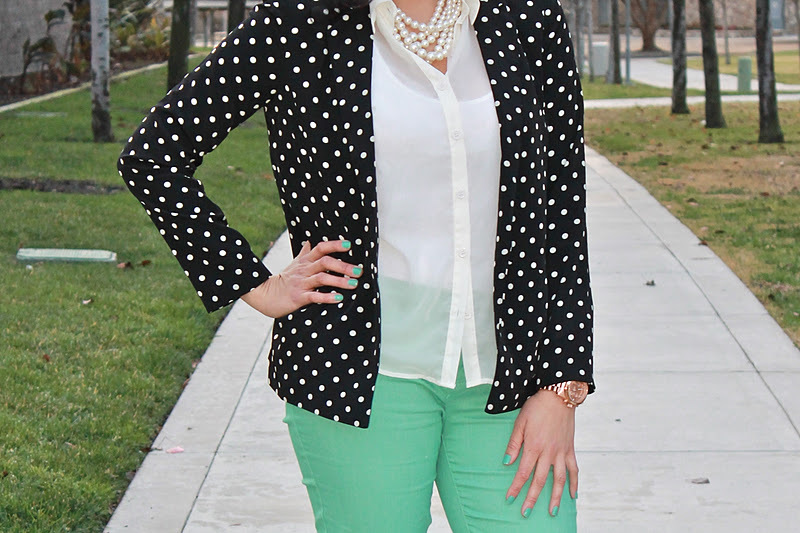 Love how you've combined the major trends of mint and polkadots, and added pearls! Very sophisticated! happy bday! this is such a fun outfit....so many things that excite the eye...the minty color, the polka dots, and the sheerness of the top. nicely done! you look gorgeous!! & thanks for the comment..
Vi tarde esta entrada, pero que bellos estos pantalones verde menta! Estas perfecta para empezar la primavera!